Your baby learns language in stages. From birth, she receives information about language by hearing people make sounds and watching how they communicate with one another. At first she is most interested in the pitch and level of your voice. When you talk to her in a soothing way, she’ll stop crying because she hears that you want to comfort her. By contrast, if you shout out in anger, she probably will cry, because your voice is telling her something is wrong. By four months, she’ll begin noticing not only the way you talk but the individual sounds you make. She’ll listen to the vowels and consonants and begin to notice the way these combine into syllables, words, and sentences. Your participation in your child’s language development will become even more important after six or seven months, when she begins actively imitating the sounds of speech. Up to that point, she might repeat one sound for a whole day or even several days at a stretch before trying another. But now she’ll become much more responsive to the sounds she hears you make, and she’ll try to follow your lead. So introduce her to simple syllables and words such as “baby,” “cat,” “dog,” “go,” “hot,” “cold,” and “walk,” as well as “Mama” and “Dada.” Although it may be as much as a year or more before you can interpret any of her babbling, your baby can understand many of your words well before her first birthday. If she doesn’t babble or imitate any sounds by her seventh month, it could mean a problem with her hearing or speech development. A baby with a partial hearing loss still can be startled by loud noises or will turn her head in their direction, and she may even respond to your voice. But she will have difficulty imitating speech. 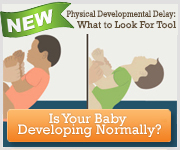 If your child does not babble or produce a variety of sounds, alert your pediatrician. If she has had frequent ear infections, she might have some fluid remaining in her inner ear, and this could interfere with her hearing. Special equipment is used to check a very young baby’s hearing. All newborns should be tested for hearing loss. Your observations are the early warning system that tells whether further testing is needed. If you suspect a problem, you might ask your pediatrician for a referral to a children’s hearing specialist.